Louise Buchholz Southern, MEd, BCBA, Associate Director of ASNC Clinical Services and Alexander (Aleck) Myers, PhD, Licensed Psychologist, Clinical Director of ASNC Clinical Services, are going to present on the topic of ASD and Puberty. Please join us! Also, bring your questions to the last meeting of the chapter before the summer break. To get on the ASNC-Durham County email list go to https://groups.google.com/group/asnc-durhamcounty and contact the group moderator. SPARK focuses on Autism research and invites families to participate through research and are currently recruiting 50,000 families for a national genetic study of autism. Whether or not you are interested in participating, there are opportunities to learn and share experiences. Check out the upcoming webinar, past webinars, and other resources available to families. Sign up for their newsletter at the website, https://sparkforautism.org/portal/homepage/. Our speakers for this webinar are Rujuta Bhatt Wilson, M.D., and Shafali Spurling Jeste, M.D. Both of them specialize in behavioral child neurology with a specific focus on autism, and they work at the UCLA David Geffen School of Medicine. Register below to join the conversation. To catch up on past webinars, please click below. Read more on our website about some of the challenges of physical fitness for individuals with autism. 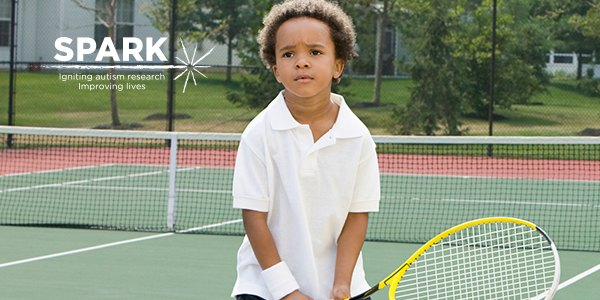 Learn about ACEing Autism, a national tennis program for individuals with autism. Take a look at research into the relationship between genetics and motor function in autism. Our webinar speakers are collecting feedback on the kinds of programs individuals with autism participate in across the country. Please consider completing our two-minute survey. Have you completed the Social Communication Questionnaire (SCQ) on your SPARK dashboard? Reports are now becoming available for download based on your answers to this survey. Log in to your SPARK account and check under “My Documents” to download your report. These reports are being rolled out over time, so if you haven’t received your report yet, it will be coming soon. If you haven’t completed the SCQ yet, please log in today to do so. This is a perfect time to help your student finish the school year on a high note! Gain key insights and tips to navigate our public schools to help your child succeed. Join us for a special 5-week daytime series (normally 6 weeks) of our popular PFAST (Parent & Family Advocacy and Support Training) for parents, guardians, and others who support our students in public schools (including charter) on five Wednesdays April 11, 18, & 25 and May 2 & 9 2018 from 10:00AM-12:00PM. Hosted by Durham County Cooperative Extension, the workshops help ANY parent and others better navigate our public schools to help their children succeed from Kindergarten through 12th grade. See the flyer and registration links above for more information. Light snacks will be provided. Please REGISTER by email, fax, or phone. Call Donna Rewalt at 919-560-0538 for more information. Space is limited and we must have 10 or more participants for a series to start. Please note this session is in English only. Gain key insights and tips to navigate our public schools to help your child succeed. Join us for a special 5-week daytime series (normally 6 weeks) of our popular PFAST (Parent & Family Advocacy and Support Training) for parents, guardians, and others who support our students in public schools (including charter) on five Wednesdays 29, April 11, 18, & 25 and May 2, 2018 from 10:00AM-12:00PM. Please note this session is in English only. LatinoPFAST / LPFAST in Spanish has a current session running. Please contact Angelina Schiavone at 919-560-7978 for more information. A resource for family members and service providers looking for day or residential summer camp experiences for children who have disabilities or special health care needs. The directory is available online at the UNC website: http://fsp.unc.edu/summer-camp. For information about additional services and resources in your community for families with children who have special needs, please call Access Family Support at 800.852.0042. Please register by clicking on the assigned registration links under each webinar description. After registering, you will receive a confirmation email containing information about joining the webinar. Remember to check out ECAC's Online Calendar for more events and details as they become available! Leigh Mobley, Dispute Resolution Consultant with the Exceptional Children Division of NC Department of Public Instruction, will explain the various options that parents can consider when major disagreements happen during the special education process. Students with disabilities are not the only ones who have legal rights when it comes to special education. Parents also have rights related to consent requirements, notifications, participation in decision making, and resolving disputes. Join us to learn more about what those rights are and why they are important. This webinar will cover what Inclusion is and why it matters. Learn about who should be included, the Least Restrictive Environment, Universal Design, Differentiated Instruction and how inclusion relates to the IEP. Be informed and prepare now to make a smooth Transition to Adulthood. Learn about the resources available to you! Join us and learn more about the steps to becoming your child's best and most effective advocate, including communicating with your child's school and IEP Team, and tips for handling any disagreements that may arise. Registration links for webinars can also be found on ECAC's Training and Event's calendar. or by calling 1-800-962-6817, ext. 317. 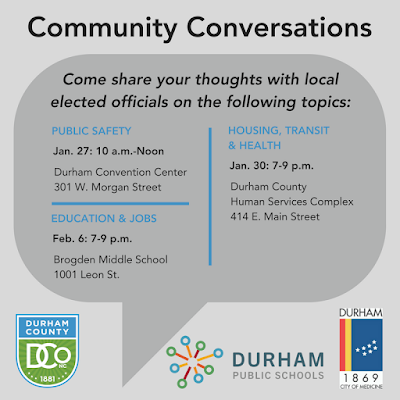 Come out Tuesday night, January 30, at 7:00 to talk about Affordable Housing, Transportation, and Health Care in Durham. Your voice matters and our elected officials from both the city and county will be there to listen. Next week, Education, including public schools, and Jobs will be talked about on Tuesday, February 6. Take advantage of this first time ever series that includes all 3 of Durham's elected bodies--County Commissioners, City Council, and School Board.